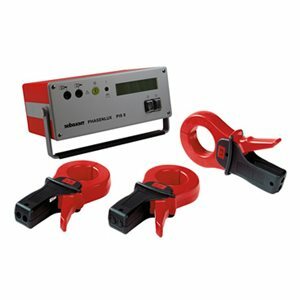 The Phase identification System PIL 8 permits a fast and especially safe phase determination at the jointing location during the mounting of medium voltage cables. Such safety measures take a lot of effort and are not always practical. PIL 8 requires that the ground or shorting must not be removed. On the contrary, this grounding is an essential part of the procedure, which means, the cable must be grounded and shorted for the system to work with the result that test is absolutely safe. For each phase the corresponding transceiver clamp is installed on the grounded cable end and then at the selection point each phase is identified and marked.